BrookfieldAngler.com: Kayak rigging!! AKA a cure for the wintertime blues! Kayak rigging!! AKA a cure for the wintertime blues! My good friends at Austin Kayak sent this to me a while back and since my stir craziness has completely taken over, I figure it would be a good time to post it and put some of this into action! Plus, rumor has it that it might actually be close to the freezing mark next week so that's kayak weather for me! 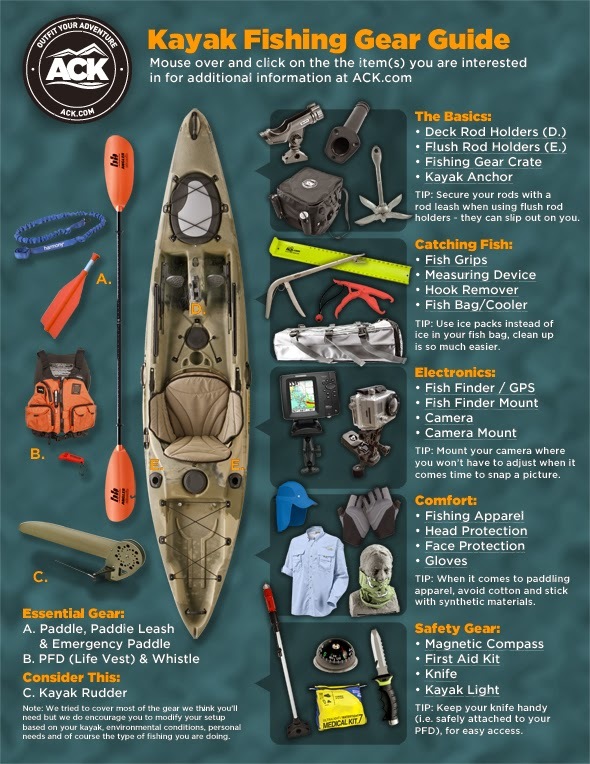 I see about 10 items there that I could use on my kayak. I hear the temperature in KY will be in the 60's next weekend. I think I need to make a trip to the lake house and dust the cobwebs off of mine. I need a larger kayak. I bought an 8 ft. Wilderness Ripper to fit inside the car. It does well but I should would like a little more room for misc. items. I really want one with foot peddles. To me that picture shows a whole lotta stuff - too much for me. I went out on a kayak bass tournament and expected to see kayaks rigged with trolling motors and all the bells and whistles. I was surprised to see that almost everyone had a basic set up. Thanks for sharing. Thanks for the comment! That is definitely on the small side for kayaks but it sure has to be easy to maneuver!! Can you actually stand and fish in thing? That to me is a bigger factor than length. If I can stand and cast comfortably, I'm a happy camper. My WS 115 does that perfectly. Now when it comes to trolling for great lakes salmon, I sure wish I had that hobie. You know, Bill...I'm not sure if you meant any sort of pun there but the word "boat" sure seems to be fitting. They are getting to be more and more boat like every year it seems!